Something that has been in the news lately has been the amount of food the collective population of the US wastes each year. Whether it is not eating everything you put on your plate or throwing out stuff that you never get around to eating or even the amount of food grocery stores throw out every day because no one buys it, the fact is, we waste a lot of it. However you look at it, the US is addicted not only to eating, but wasting food. One of the biggest drivers of food waste is the “expiration date”. This date is prominently featured on just about every package of food you find on the shelf. Sadly, it is a poor conveyor of useful information. It’s name is most misleading as nothing magically happens when that date passes. Many canned, boxed or frozen foods are good for months or years after that date as long as they are preserved without damage. Sadly, this date leads a lot of people to throw out perfectly good food. Recently, I have gained first hand knowledge of just how much food is wasted. My wife and I took up dumpster diving as not just a way to pad out our monthly budget, but also as a way to fight this collective waste. Our first experience was so-so. We picked up a few dozen perfectly good ears of corn, a dozen packages of tortillas and what turned out to be, after cleaning, a gallon size freezer bag full of blueberries. Not bad for a first time, but nothing close to being anything to write home about. This food was more than enough to fill our medium sized chest freezer. We also stocked some of our shelves with the chips and such that we found (shelves not pictured). We have plans to go out again and see what else we can find. Anything we find that is more than enough for our family will be shared with others or donated. There is no reason why all this food must go to waste. Now, some of you may consider this gross. That is understandable. 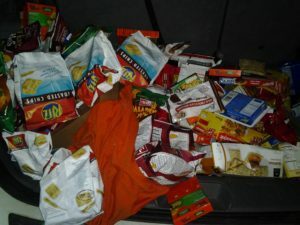 Going through dumpsters can be kind of icky. However, some things you can simply take out of the package, like we did for all the pizza stuff, or you can wipe it down with bleach wipes. It doesn’t matter, because you aren’t going to eat the packaging, just what is inside. For fruits and veggies, a vinegar bath is good enough to clean and disinfect them. So, unless you eat straight from the dumpster, there is little chance of getting sick. In the end, this experience has given my family a new appreciation of what we have in the US. We just need to stop thinking of things as “expired” or otherwise bad. We need to stop buying more than we can eat. If you are going to buy in bulk, buy stuff that in nonperishable such as canned goods. Freezer stuff can also keep for a long time, though not as long as canned foods. That is our hope for next time. We want to find more canned food. But we aren’t going to look a gift dumpster in the mouth. 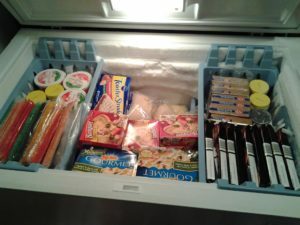 This stock of freezer food will keep us happy for a while.